There is only a little bit of a month left to apply for the 2020-21 Rotary Peace Fellowship. Up to 100 fellows are selected every year in a globally competitive process based on personal, academic, and professional achievements. 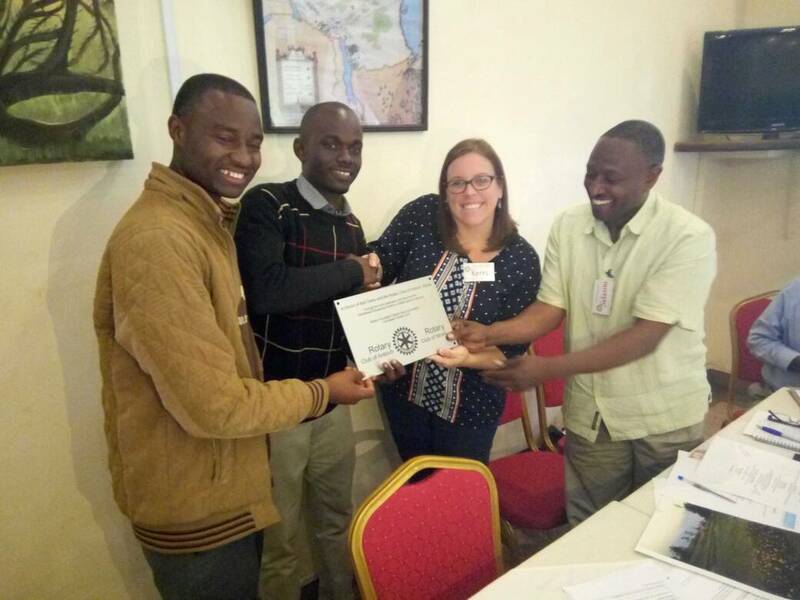 Fellows earn either a master’s degree or a professional development certificate in peace and conflict studies at one of the Rotary Peace Centers, located within seven leading universities around the world. More than 1200 program alumni are working in over 100 countries as leaders in national governments, NGOs, social enterprises, the military, law enforcement, and international organizations such as the United Nations. For more information click on the read more button. It's time again for the annual District 6440 Conference. It's being held on Friday May 3rd and Saturday May 4th at the Hyatt Regency Hotel in Schaumburg. This is a great opportunity for Rotarians to learn more about District 6440, hear speakers to help inspire greater things in the future, and it brings Rotarians together for fellowship and to share ideas and learn more to benefit those in need. For further information and registration click here. The updated duty roster for the rest of the Rotary year is now available for download. Look down the right side for the home page download files and click on the file to download. RI President-elect Mark Daniel Maloney’s theme for 2019-20, Rotary Connects the World, asks Rotarians to strengthen the many ways that Rotary Connects the World, building the connections that allow talented, thoughtful, and generous people to unite and take meaningful action through Rotary service. Click on read more to see PE Mark's full message. It's time to get ready for the International Convention in Hamburg Germany. Hit read more to see a special invitation from RI President Barry Rassin. 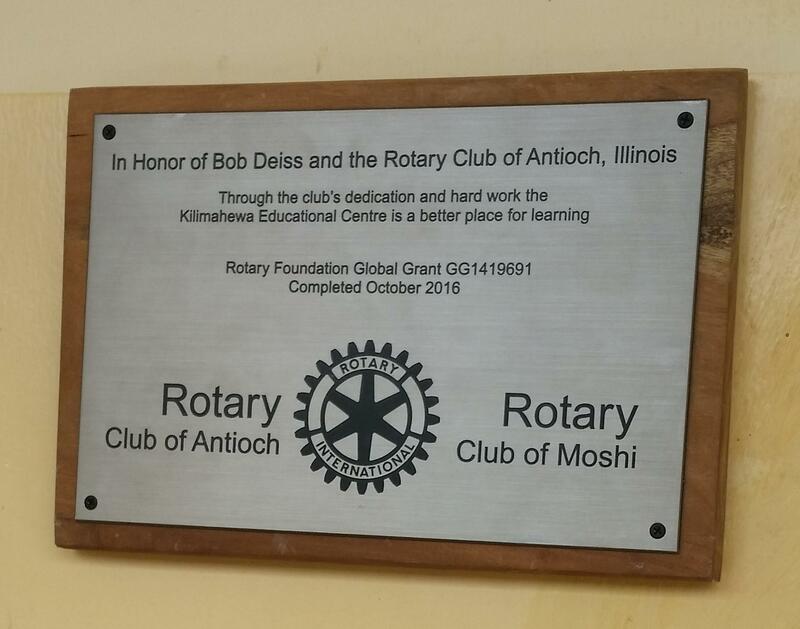 This month in Tanzania the honorary plaque to former Antioch Member Bob Diess was mounted on the wall of the Kilimahewa Educational Centre. This plaque was purchased to recognize the amazing work Bob did to help secure a Rotary International Global Grant for the Kilimahewa Educational Centre. 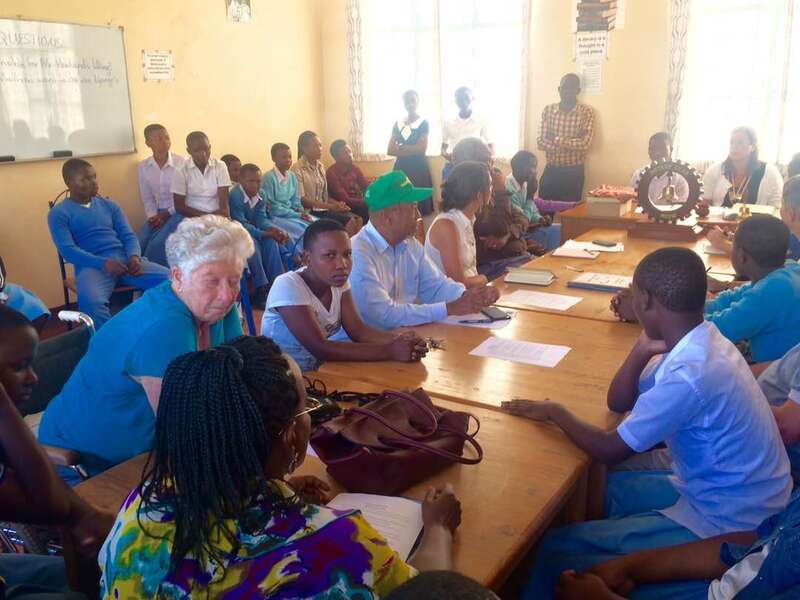 This grant funded various educational opportunities for vulnerable teens in Tanzania to learn skills such as a computers skills, agro-business skills, and entrepreneurial skills. The global grant led to a strong partnership with Rotary and the development of an Interact club within Kilimahewa. 28 students helped from the 1st Interact club in memory of Bob and the amazing work he did to help the school. These pictures show the plaque mounted on the wall at Kilimahewa. The new Interact advisers attending a Rotary meeting to accept the plaque committing to start a Interact club. And the first Interact meeting with Rotary members present sharing goals and ideas for the future. Mike Schwert received an email from Emily Andre, first Interact Co-President and Rotary Scholarship recipient. She has completed her degree at American University and has almost completed a Peace Corp assignment in 5 years. We can all be proud of her and what she has done with a little help from us. Click on "Read More" to read her email and see pictures from her Peace Corps work. 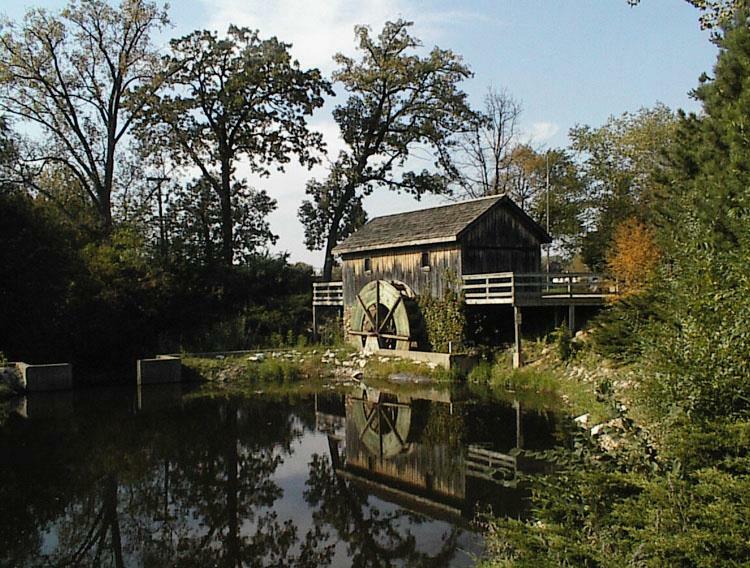 The Rotary Club of Antioch is now on Facebook. I've invited a couple of Rotarians to join but go the to Facebook page and click the following box to add it to your favorites to get notification of activities or message posts.You'll find the page at www.facebook.com/antiochrotary. An updated Potential New Member Brochure is available in the "downloadable file" section. The brochure has 20 Reasons to Join Rotary - as found on the District 6440 Website, as well as, some information on the Five Avenues of Service. 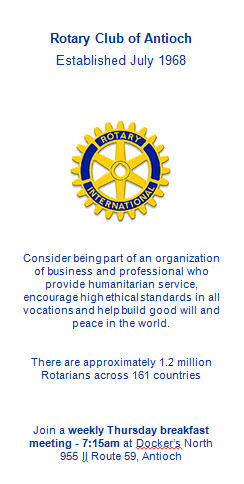 Two key facts that are good for you to remember as rotarians: There are approximately 1.2 MILLION Rotarians around the world in 161 countries. Antioch Rotary Scholarship Inc Tax Exempt Cert.